April 25, 2016 – In this episode, we’ll step through the Guardian of Forever and meet two founding fathers who were best friends, then bitter enemies, and finally friends again: John Adams and Thomas Jefferson, the second and third presidents of the United States, and the first and second vice presidents. 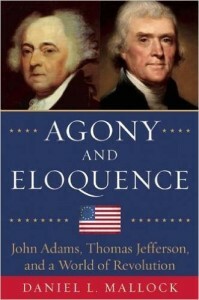 Our guide on this journey is Daniel L. Mallock, and his book is Agony and Eloquence: John Adams, Thomas Jefferson, and a World of Revolution . Daniel L. Mallock grew up within walking distance of Peacefield, John and Abigail Adams’ home in Massachusetts, and was also a member of the Quincy Historical Society in the Bay State. You may have seen his previous history work in North and South. But if not, check out his website: DanielMallock.com. And if you’re going to be in the New England area this summer, catch Dan at Bunker Hill Day, June 17, 2016, where he’ll speak about “John Adams, Thomas Jefferson, and the Other Revolution” at the Adams National Historic Park in Quincy, Massachusetts.